Outdoor fireplace plans are a lot easier to come by than they used to be because outdoor fireplaces have hugely gained in popularity over the last few years. Outdoor fireplaces add beauty and warmth to the backyard, giving you a cozy place to relax with friends and family throughout the year. In the summer you can use it instead of a traditional barbeque to cook foods, and in the winter you can gather around it to stay warm after a skating party or snowball fight. Day or night, summer or winter, an outdoor fireplace is a wonderful place to gather with loved ones and enjoy time spent outdoors. It's important to make plans before building or purchasing any kind of outdoor fireplace. When building or placing an outdoor fireplace, the first thing to consider is location. Building one is a big commitment and not inexpensive so think long and hard before making a decision. Choose a spot that is convenient and permanent. Should you choose to change the landscaping or design of the yard at a later time you don't want to have to move the fireplace. Once an outdoor fireplace is installed, you want it to stay in the same place as long as you have the house, as moving one is a huge expense. Try to put it in an area that compliments the house and yard and is also convenient. Most people tend to place them in or around areas used for entertaining. The layout of the house and garden will also affect the location. The fireplace should not block the view from the house, nor should it obscure any other interesting features. Remember also that the fireplace should not be placed upwind of the house, particularly if it's a wood-burning fireplace. Because of these considerations, it's important to make up outdoor fireplace plans before building. When it comes to the style of the fireplace one must consider the surrounding area, such as the main house, the yard, and any other structures. You want a style that will fit in with and compliment what's around it. The architectural design of the house and garden should influence the style in a huge way. For instance, an ultra modern house might look a bit odd with a traditional and decorative fireplace in the backyard (and vice versa). Every outdoor fireplace, whether it's portable or permanent, needs to be used or built according to local building codes. Often these codes will include the type of materials that can be used, size restrictions, and limits on locations. During the planning stages be sure that you are familiar with the codes in your area, or you might face some challenges when you start building. 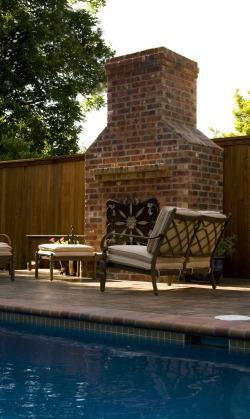 Outdoor fireplaces are often made of stone or brick. Occasionally they are also made of cast iron or aluminum alloy. All of these come in different colors and finishes so think about how you want your outdoor fireplace to look. When deciding what materials to use, think about what will match or compliment the house. Outdoor fireplace plans are quite similar to those used indoors. The only real difference is that outdoor versions don't use dampers. Most permanent outdoor structures are built with tall chimneys so the smoke from the fire is dispersed far away from where people are seated. With the natural ventilation of the out of doors, there's no worry about things getting too smoky. If building a permanent structure just isn't in the cards, be it for space restrictions or financial reasons, you can still enjoy the benefits of an outdoor fireplace. Mexican style chimney pots called chimeneas are very popular and come in many different sizes. They consist of a round, bowl-shaped base with an attached chimney. Just like with a traditional fireplace, the materials to be burned sit in the base and the smoke flows through to the opening in the top of the chimney. If you decide to purchase one make sure that they are allowed in your area. Just like with any type of outdoor fireplace, local codes need to be checked out for safety reasons. An outdoor fireplace is a wonderful addition for homeowners who enjoy maximizing their time outdoors. Whether it's permanent or portable, large or small, an outdoor fireplace makes a great gathering place for friends and family who come to visit.